Kelli Tittle has been named director of compliance at Wright State University. 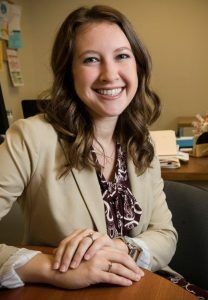 Among her duties will be coordinating compliance activities and compliance training across campus, conducting yearly compliance audits and overseeing the university’s anonymous reporting line. Her appointment is effective Nov. 1. Tittle is currently Wright State’s HIPAA and privacy compliance officer in the Office of the Vice President for Research. Prior to coming to Wright State, she was the director of health plan compliance for Premier Health. “As Wright State’s director of compliance, Ms. Tittle’s responsibilities will include chairing the university’s compliance council, coordinating compliance activities and training across the campus and conducting an annual compliance audit and risk analysis,” said Provost Thomas Sudkamp. Tittle earned a bachelor’s degree in history from Wright State in 2006 and a law degree from the University of Dayton School of Law in 2009. She is a board member of the Wright State Alumni Association. The purpose of creating a university-wide Compliance Program is to help the university reach and sustain a mature infrastructure to support all the elements necessary for a strong compliance program and to have an organization in which compliance is culturally ingrained in every stakeholder and where best practices, collaboration and transparency permeate decision-making at every level of the university.